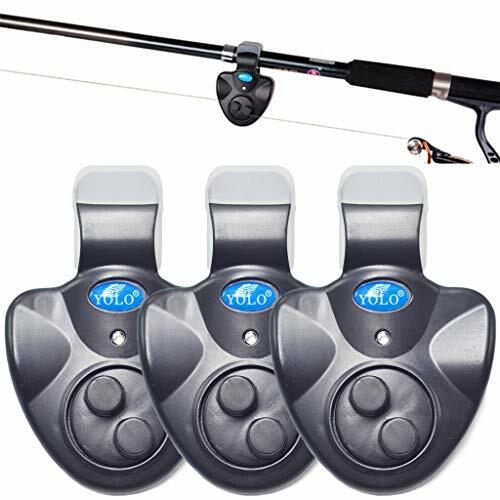 Simply clamp it on your fishing pole, wrap fishing line around dial switcher and you are ready to fish. 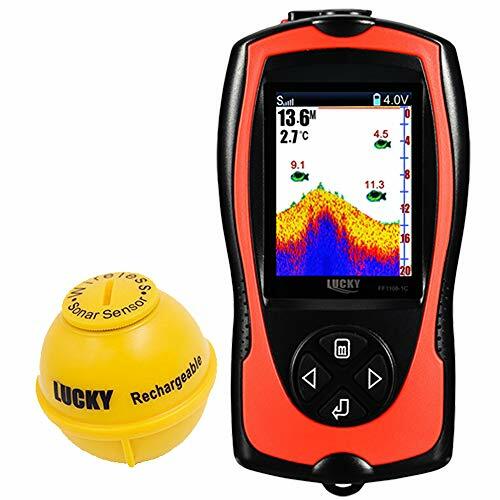 Lucky portable fish finder is especially designed for amateur and professional fisherman. It can detect the water depth and find out the fish easily. Just enjoy your fishing time! 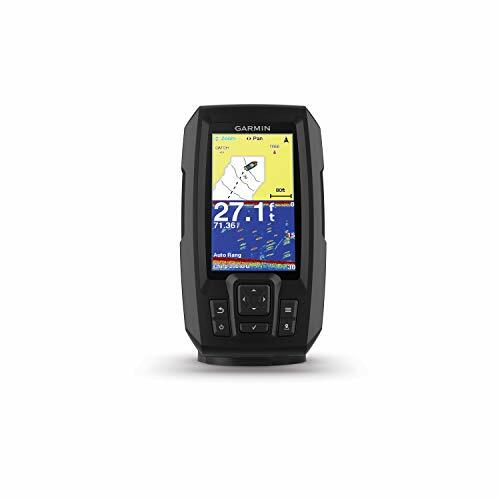 Detect sensitivity: The fish finder transducer controls how many details shown on the display. You can set up the sensitivity from 1 to 10. The more sensitive it is, the more detailed it can detect. Fish alarm: An alarm will sound when the portable fish finder detect fish corresponding to the alarm setting. It can distinguish the relative fish size(large, middle and small) in a certain water area. Units: You can choose four different units from the menu--M/ , FT/ , M/ , FT/ . Tie the fishing line to the hole of the sonar sensor, and cast it to the water. Attach the adapter to the fishing boat hull using the mounting tabs. Ice fishing, river fishing, sea fishing, kayak fishing, shore fishing. The sonar sensor is waterproof, but the hand held depth finder is not. 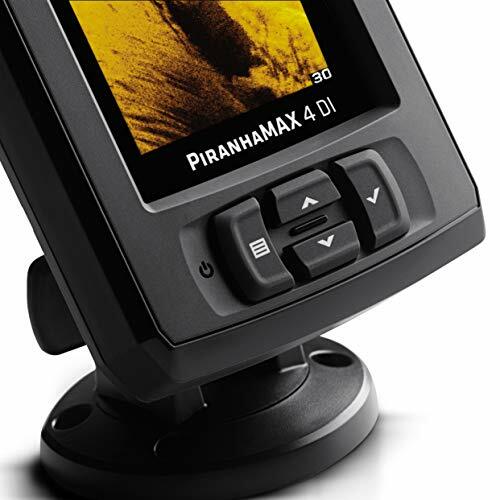 Please do not submerge or spray the fishfinder's screen housing with water or use chemical to clean. 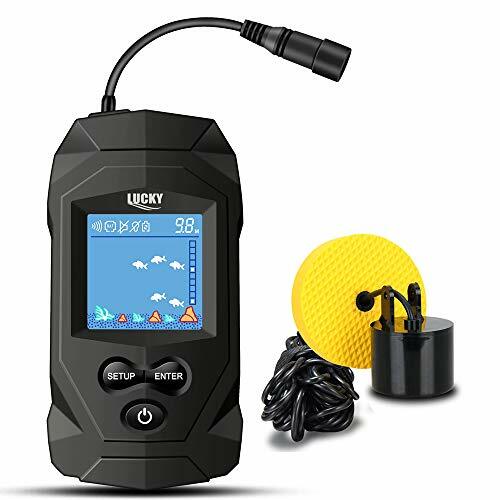 The portable fish finder, with 2.4inch TFT color LCD screen, can detect and display underwater contour, water depth, water temperature and fish size with depth. It has two user modes: WIRELESS/SIMULATION. You can try all functions in simulation mode and go fishing in wireless mode. The wireless sonar transducer, with fish attractive lamp, makes it easier to detect fishes. It has a transparent replacement cover, so you can see where the sensor is even in the dark. The wireless fish finder supports 196FT(60m) wireless operating range(There is an antenna on the left top of the hand held, please pull it out), 147FT(45m) depth detection. You can go fishing in different ways with it, such as ice fishing, river fishing, sea fishing, fishing off the shore, kayak fishing or fishing in the night. 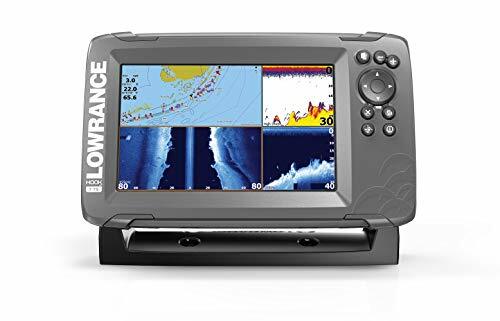 Various features settings: detect sensitivity, screen brightness, depth range, zoom, depth alarm, fish alarm, fish icon, units alter and language choose. Both of the wireless fish finder and the sonar are rechargeable. Come with a USB cable for charging. The hand held can last 4 hours with full charge and the sonar sensor can last 10 hours with full charge. 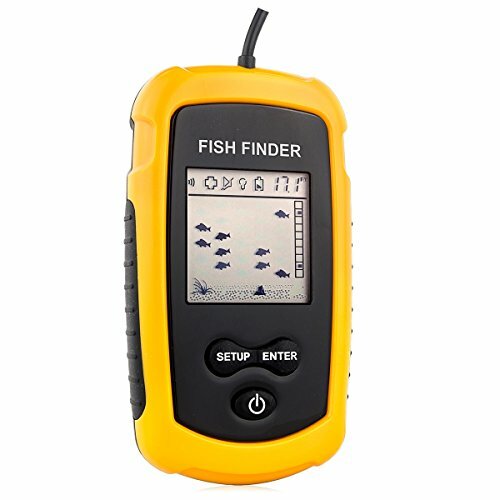 The wired fish finder portable is especially designed for amateur and professional fishermen alike, to find out the location of fish and depth of water. The unit can be used in ocean, river or lake and is fantastic for detecting schools of fish in any particular area. Weed display: the display indicates the presence of short weeds by turning on the smallest Weed indicator Moderately tall weeds are depicted by turning on the second Weed indicators. Bottom contour:One rock indicator identifies limited structure you would most likely find a small rock, a small pile of rocks, or uneven bottom contour. 1. 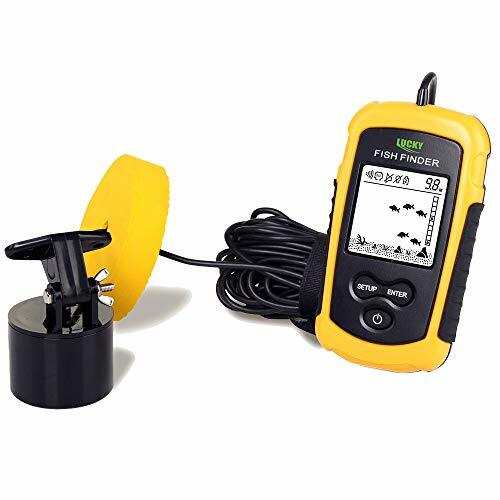 The wired fish finder portable must be turned off to enter normal operation from simulation mode. 2. If depth readings appear as "---" while using one of these methods, place the wired sonar sensor directly in the water to verify that the depth finder is operating properly. If it operates properly while directly in the water, reposition the wired sonar sensor in a new location in the hull, and repeat the methods in above. 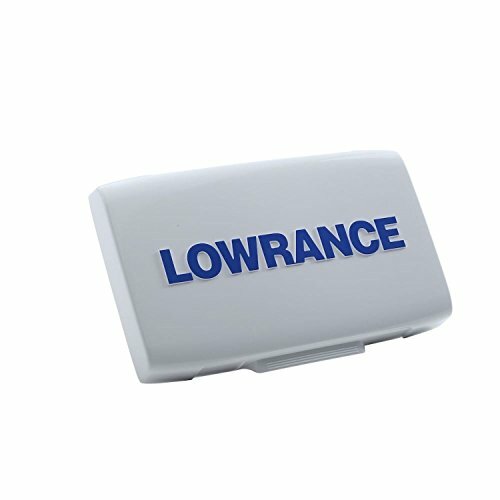 Wired Sonar Sensor: The wired sonar sensor allows 45 detect angle with 100m(328ft) depth detection. Details On Display: Fish icon, bottom contour, battery strength indicator, water depth, sensitivity indicator shown on the screen. 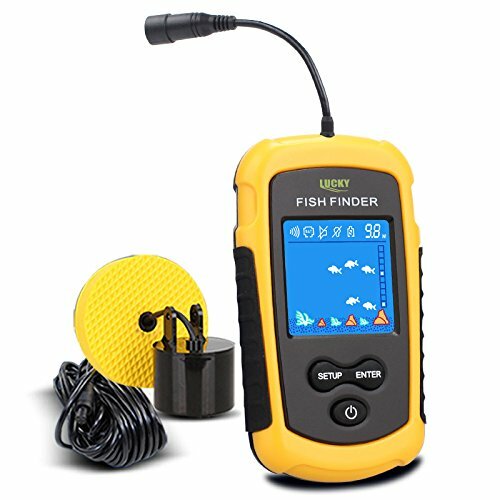 The wired fish finder portable is a good helper for finding fishes. Using Methods: You can cast the sonar sensor transducer into the water or tie it on your boat hull. Good use for ice fishing, kayak fishing, sea fishing, etc. Portable Fish Finder: The wired fish finder is small and portable and easy to carry. Put it in your pocket and then you can take it to anywhere you want. Package Include: Come with round sonar transducer with 7.4m cable, transducer adapter, stainless bolt, stainless wing nut and neck strap. 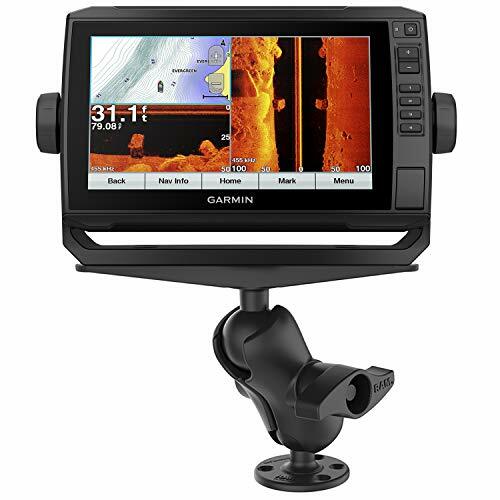 Save with this Exclusive Bundle which includes a RAM Mount Large Marine Electronics Mount, part number RAM-D-111U-C. Valued at $101.99! The Combo with Connections Bright, sunlight-readable 9" keyed-assist touchscreen combo Includes GT52 transducer for Garmin high wide CHIRP traditional sonar plus CHIRP ClearV and CHIRP SideV scanning sonars; compatible with Panoptix all-seeing sonar (sold separately) Preloaded LakeV g3 maps with integrated Navionics data cover more than 17,000 lakes with up to 1' contours Built-in Quickdraw Contours mapping software instantly creates personalized fishing maps on-screen with 1' contours as you fish Use built-in Wi-Fi to pair with the free ActiveCaptain app for access to OneChart, smart notifications , Garmin Quickdraw Community data and more Bright, sunlight-readable 9" combo offers the convenience of a keyed-assist touchscreen. 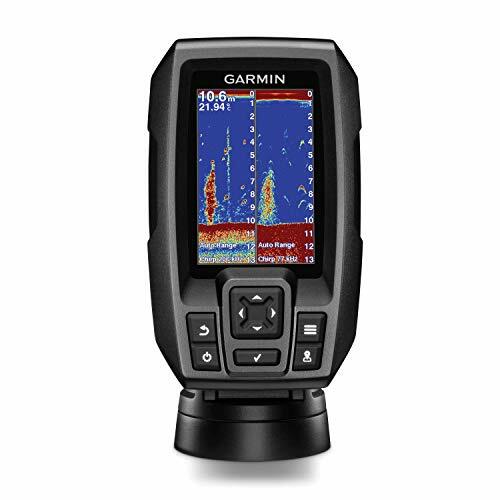 It comes with a GT52 transducer that encompasses Garmin high wide CHIRP traditional sonar plus CHIRP ClearV and CHIRP SideV scanning sonars, and it's also compatible with Panoptix all-seeing sonar. It comes preloaded with LakeV g3 maps with integrated Navionics data, covering more than 17,000 lakes with up to 1' contours. 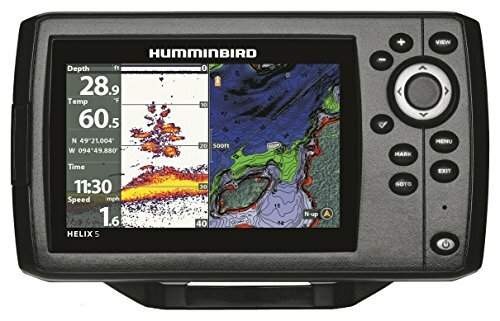 Plus, it has Quickdraw Contours mapping software to instantly create personalized fishing maps on-screen with 1' contours as you fish. It also has built-in Wi-Fi to pair with the free ActiveCaptain app for access to OneChart, which allows you to purchase and download new charts. ActiveCaptain also gives you access to smart notifications , the ActiveCaptain community for marina and other points of interest details, Quickdraw Community data and more. Features quick-release bail mount to make it easy to remove and take with you. Transom and trolling motor mounts included. 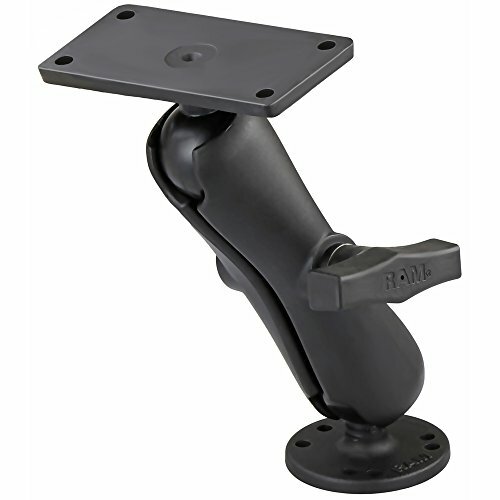 EXCLUSIVE BUNDLE INCLUDES the RAM-D-111U-C Large Marine Mount from RAM Mounts, the leading manufacturer of rugged and versatile mounting solutions! 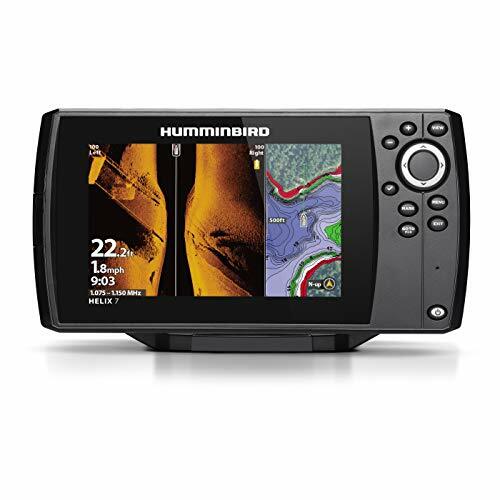 Humminbird 410950-1NAV Helix 7 Fishfinder Chirp MSI GPS G3 with Navionics + Card. 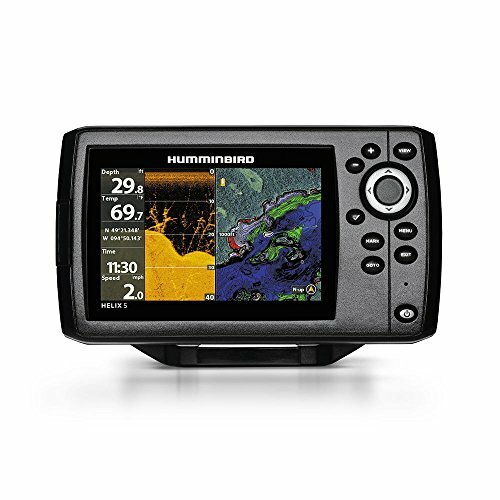 Humminbird 410950-1NAV HELIX 7 Fishfinder CHIRP MSI GPS G3 NAV. 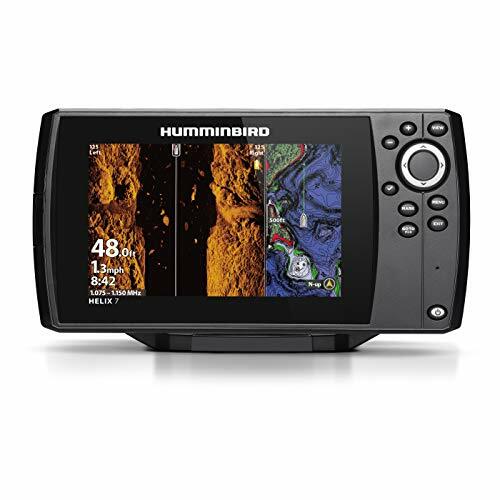 The HELIX 7 CHIRP MEGA SI GPS G3 NAV+ fish finder features MEGA Side Imaging, MEGA Down Imaging, Dual Spectrum CHIRP Sonar, AutoChart Live, GPS and Humminbird Basemap built-in. The 7", ultra-wide display gives you ample room to view the many pre-loaded split screen view options. This unit includes a Navionics+ map card with data for over 21,000 lakes in the U.S. and Canada.